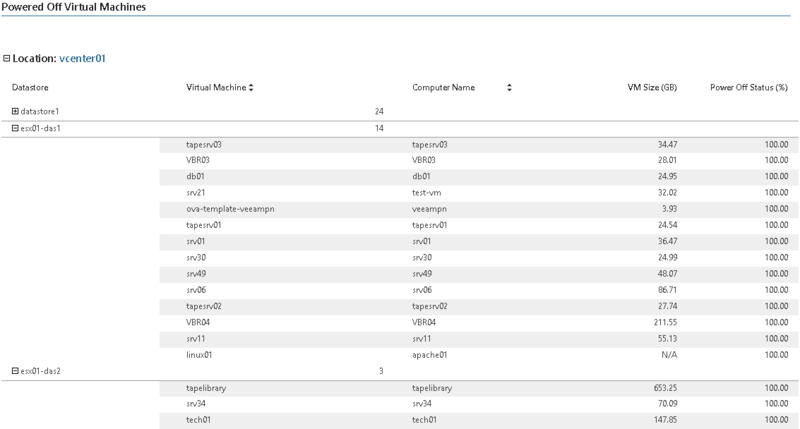 This report shows a list of VMs that were remaining in the powered off state during the specified period. For each powered off VM, the report shows its location, size and the datastore where the VM files are stored. Powered off VMs do not consume CPU, memory or network resources, but they take up storage space required to accommodate their disk files, snapshots and configuration data. The report helps you detect VMs that can be relocated to less costly datastores and identify neglected VMs that can be decommissioned. Interval - Interval Type: defines the time period to analyze in the report. Note that the reporting period must include at least one data collection session for the selected scope. Otherwise, the report will contain no data. Power Off Percent: defines the amount of time when the VM was powered off against the amount of time in the reporting period (in percentage).